The world lost a great man . English Lesson Plan on Nelson Mandela is from Famous People Lessons. The Voice of Mandela is an amazing interactive from The New York Times. World Leaders Honor Nelson Mandela is from Mashable. Nelson Mandela, Who Led South Africa’s Liberation, Dies at 95 is his obituary in The New York Times. Latest Updates: Global Reaction to the Death of Nelson Mandela is from The NY Times. The Contradictions of Mandela is a NY Times op-ed. Mandela Lives is by Nicholas Kristof. Nelson Mandela’s Death, As Told By Newspaper Front Pages is from BuzzFeed. 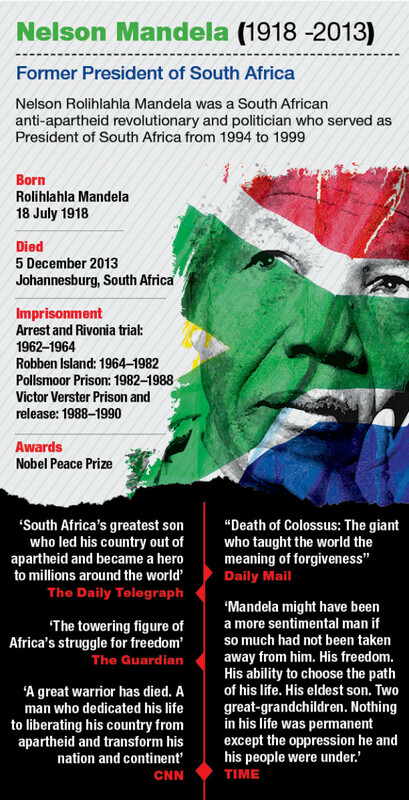 Nelson Mandela: interactive timeline is from The Telegraph. Here’s USA coverage of his death. Mandela’s Struggle in Posters is from The NY Times. This is how Nelson Mandela thought about policy is from The Washington Post. The Long Walk of Nelson Mandela is from PBS. 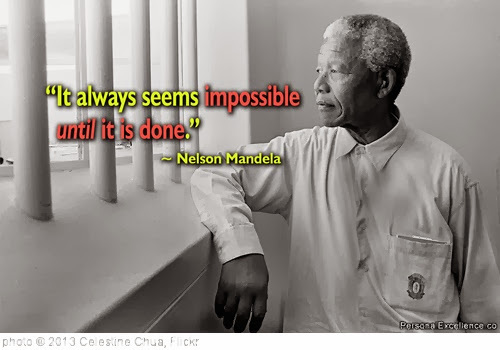 12 Mandela Quotes That Won’t Be In the Corporate Media Obituaries is from common Dreams. See how South Africa changed over Nelson Mandela’s lifetime is from The Washington Post. Rare Footage of Mandela in Prison is from The New York Times. ‘Free Mandela (From the Prison of Fantasy)!’ is also from The NY Times. The Zinn Education Project has a number of resources. World mourns Nelson Mandela (8th December, 2013) is an ESL Lesson Plan from Breaking News English. The World Reacts To Nelson Mandela’s Death is a TIME slideshow. Nelson Mandela, 1918-2013 is an Atlantic slideshow. The World Mourns Mandela is an Boston Globe slideshow. You may have already seen or heard about “His Day is Done: A Tribute Poem for Nelson Mandela by Maya Angelou,” which was produced by the U.S. Department of State’s Bureau of International Information Programs in December 2013. Here’s a version of it with English subtitles. You can access videos of it with subtitles in numerous other languages here. Unfortunately, the only transcript of the poem I’ve found so far is this one, which includes the time in the video each sentence appears. If you know of one, or have created one, let me know. ABC News has an interactive infographic on his life. The Mandela Playlist: A Life And Legacy, Told In Music is from NPR. How Nelson Mandela became the man we knew is from CBS News. Mandela and The Politics of Forgiveness is from The New Yorker. The CBBC Newsround has a very accessible page with many features on Mandela. Crowds Mass in South Africa to Bid Farewell and Honor Mandela is from The New York Times. World leaders join singing crowds for Mandela memorial is from CNN. The Nelson Mandela Memorial Service is from The Atlantic. Visualizing Apartheid – Teaching Students About Nelson Mandela is from The ASIDE blog. LISTEN: President Obama Delivers A Eulogy For Nelson Mandela is from NPR. Nelson Mandela’s Memorial Service In South Africa is from NPR. From Rebel to Statesman: Teaching About the Life of Nelson Mandela is from The New York Times Learning Network. In Defense of Mandela’s Defense of Tyrants is from TIME. Honoring Mandela is a photo gallery from The New York Times. Highlights From Memorial Service for Mandela is from The NY Times. Read President Obama’s powerful eulogy for Nelson Mandela is from The Washington Post. Nelson Mandela’s Funeral in Pictures is from TIME. AP PHOTOS: Signs of global devotion to Mandela is from The Associated Press. NextVoting is open! Check out the 2013 Edublog Awards nominees!